If there’s one thing that unites engineers, it’s the quest for continuous improvement. In UW ChemE, you’ll see this guiding principle at work not only in our labs, but also in our classrooms, start-up business ventures, student organizations, and outreach activities. Our faculty and students are engineering molecules, materials, and devices with the potential to change industries: chemical, biotech, clean energy, and beyond. In the classroom, our faculty consistently receive teaching awards and develop highly-ranked, relevant courses that incorporate project-based learning. We are proud of the entrepreneurial students and faculty among us who are earning patents and spinning out start-up companies to propagate cutting-edge technology in the marketplace. And we celebrate the tireless outreach work that plants the seed of STEM enthusiasm in the next generation. We’re improving how we go about the very process of engineering. The department is launching exciting new initiatives to leverage powerful data science tools in research and equip our students with computational skills that set them apart. Our graduate curriculum now offers a comprehensive menu of choices for Ph.D. and master's students seeking training at the nexus of chemical engineering and data science. Data science increases our capacity to do engineering, and we are well-positioned at the leading edge of this revolution. Beyond that, perhaps the most-important continuous improvements we’re making are in the world around us. The results of chemical engineers’ work can make people healthier through better medical devices and smarter drug delivery methods, and improve our resiliency in the face of a changing climate through more-efficient photovoltaics and better batteries that replace dirtier fuels. And that’s just scratching the surface. Every day, ChemE lays the groundwork for innovative solutions for this generation and those to come. 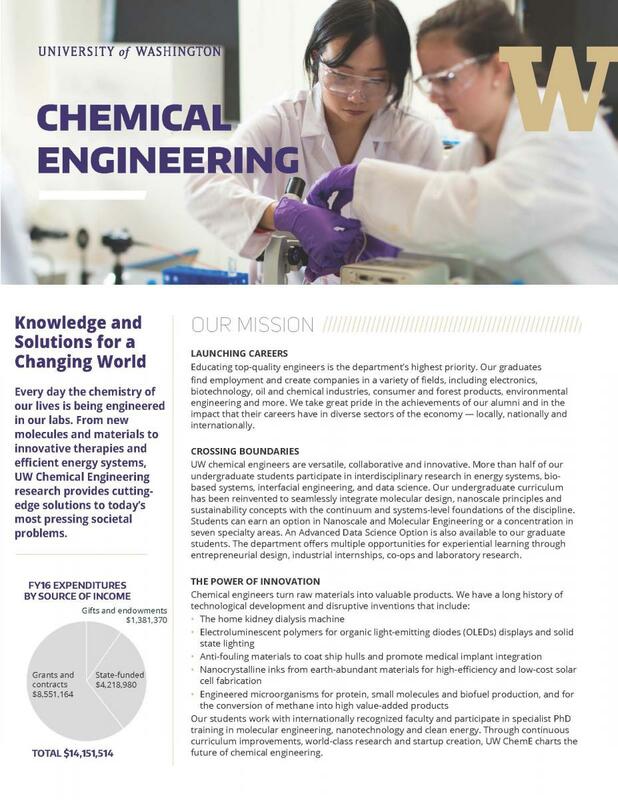 I invite you to explore our website and learn how the people of UW ChemE are developing knowledge and innovations to tackle some of society’s most pressing problems — with unrelenting drive and creativity. The ChemE factsheet (PDF) provides a quick overview of the department.